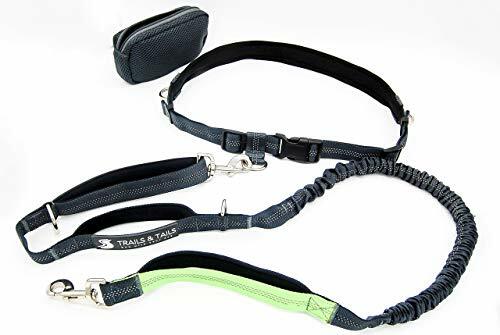 Trails & Tails Ultimate Hands Free Dog Leash, Retractable and Shock-Absorbing - Designed for Running, Hiking & Walking w Three Neoprene-Padded Handles & Reflective Stitching - Bonus Removable Pouch! Trails & Tails Ultimate Hands Free Dog Leash, Retractable and Shock-Absorbing - Designed for Running, Hiking & Walking w Three Neoprene-Padded Handles & Reflective Stitching - Bonus Removable Pouch! by Trails & Tails at Carrie J Keenan. MPN: 4334785893. Hurry! Limited time offer. Offer valid only while supplies last. We had a hard time finding good leashes for our dogs. Especially to run or hike. We tried several existing products, and all had significant flaws. We had a hard time finding good leashes for our dogs. Especially to run or hike. We tried several existing products, and all had significant flaws. The waist belt wasn't padded and dug into our body; the length was too short, handles weren't in the right place or easy to grab, the ring where the leash attached broke or didn't stay in the right place. Introducing the Tails & Trails Ultimate Leash! Our waist belt has neoprene padding around the back. Providing a much more comfortable experience for those of us with dogs that pull! We added 3 metal D-rings secured w heavy duty stitching instead of easily broken plastic parts. One in the front and on each side for three different leash positions. The rings can be used for clipping accessories such as waste bags, portable water dishes and more! Adjustable clips on each side keep the belt from loosening during use. The leash is 54" and stretches to 65" with the strongest of dogs thanks to 20" of bungee. The ideal length for running and walking. There are 3 durable, strong and padded handles down the leash. They are all neoprene padded for comfort and easy to grab. The top loop allows for traditional use when unattached from the waist belt. The next is 12 inches down, just above the bungee section, allowing for a little extra control or a training tug when needed. There is a traffic control handle at the bottom for intersections, encounters with other dogs or those times when you want complete control. We also added two D-rings to the leash for accessories or securing the dog to a fixed point. For added safety, we added reflective stitching all the way around the waist belt and the length of the leash. 3-in-1 functionality. Hands-free leash, traditional leash, or secured to a fixed point. Perfect for when you want to attach the leash to your chair. We know you'll love it, but if for some reason you don't, just let us know and we will make it right. 3-in-1 LEASH - This leash offers three incredible options. Hands-free use with the neoprene padded waist belt, as a regular leash using the neoprene handle by unclipping from the waist belt or to anchor the dog using the top clip and one of the extra strong D-rings to secure to a post, chair, etc. NEOPRENE PADDED WAIST BELT & THREE HANDLES - the back of the waist belt is padded with neoprene for maximum comfort. All three thick handles (Top Loop, Mid and Traffic Control) are neoprene padded for comfort and easy access. THREE D-RINGS ON THE BELT - We've added three points of attachment to the waist belt. One in the front and one on each side. The belt is adjustable from 26" to 44". Created for the dog owners that enjoy the outdoors. Ideal for running, hiking and walking on the road or on the trails. 54" LENGTH - Perfect distance for running compared to other leases that are too short for running. This leash will stretch to a little over 60" by the strongest pulling dogs. SAFETY FIRST - Reflective stitching runs the entire length of the leash. The three handles allow for controlling your dog in any circumstance. Manufacturer: Leopard Dog Supply Co. Publisher: Leopard Dog Supply Co. Studio: Leopard Dog Supply Co.
View More In Hands Free Leashes. If you have any questions about this product by Trails & Tails, contact us by completing and submitting the form below. If you are looking for a specif part number, please include it with your message.